The GUC is congratulating dear alumnus Dr. Tarek Zaki and his team for the latest achievement of winning The AMA Innovation Award. As eloquently put by WHO, the World Health Organization, clean air is a basic requirement of life. The quality of air inside homes, offices, schools or other private and public buildings where people spend a large part of their life is an essential determinant of healthy life and people’s well-being. 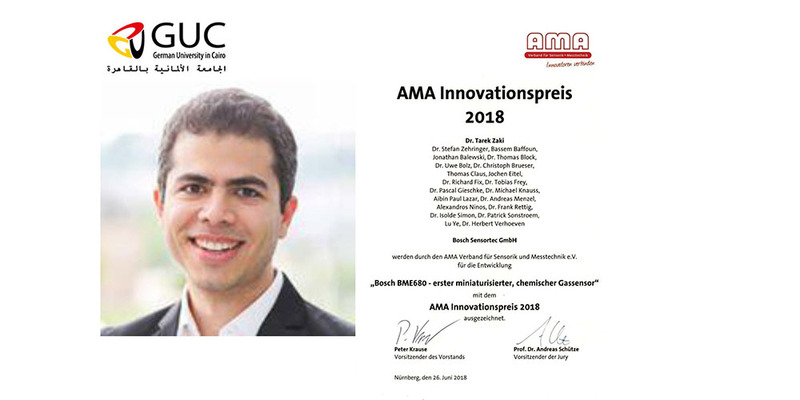 In an effort to improve the public health, Dr. Tarek Zaki, a GUC graduate and currently a project manager at Bosch Sensortec, has won together with his team this year’s AMA Innovation Award for introducing the world's first miniaturized 4-in-1 temperature, humidity, pressure and indoor air-quality sensor to the market. Not only the sensor allows to sense the surrounding environment but also enables the users to actively monitor, and thus limit, their exposure to hazardous gases. Bosch Sensortech GmBH is a fully owned subsidiary of Robert Bosch GmbH dedicated to the world of consumer electronics; offering a complete portfolio of micro-electro-mechanical systems (MEMS) based sensors and solutions that enable mobile devices to feel and sense the world around them. Bosch Sensortec develops and markets sensors, solutions, and systems for applications in smartphones, tablets, wearable devices and various products within the IoT (Internet of Things). 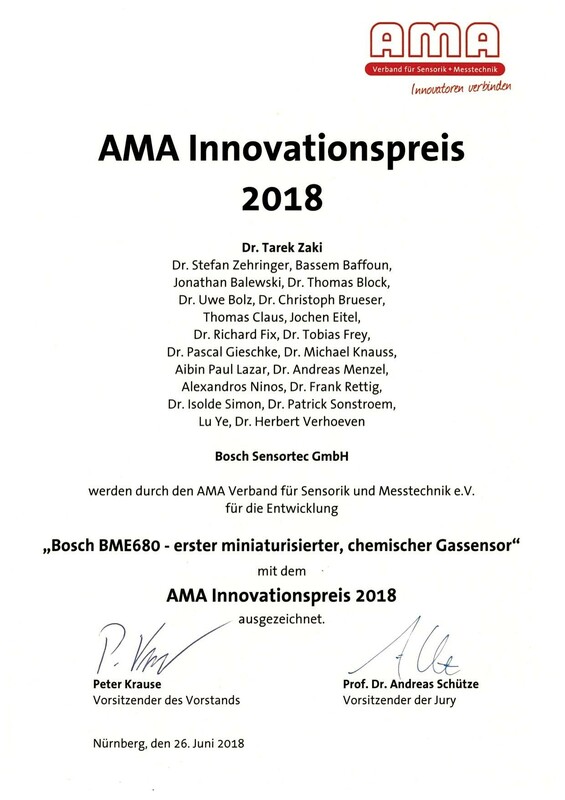 The AMA Innovation Award is presented since the year 2000 for outstanding research and development work. It is one of the most coveted awards in sensor and measuring technology.